Preschoolers can make this pretty corsage and present it to mom on Mother’s Day! 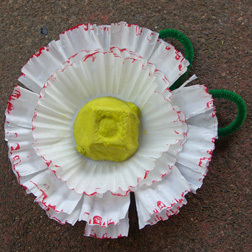 What You Need: 2 jumbo-size muffin tin liners; 2 regular (cupcake) size liners; red marker; section from egg carton; yellow paint; green pipe cleaner; paintbrush; scissors; adhesive (glue, stapler or tape). How to Make It: Paint egg carton section yellow and let dry. Have children cut into the ruffled sides of the liners, from the edge to where the ruffled part ends. They can make cuts about 1/2″ apart, or make designs or whatever they’d like. Run red marker around edges of each liner. Stack liners and secure in center with stapler or glue. Bend pipe cleaner into leaf shapes and secure on back with stapler or tape. Glue or tape yellow egg carton section to center. This entry was posted on Wednesday, May 6th, 2009 at 8:55 pm	and is filed under Mother's Day crafts, Valentine and heart crafts. You can follow any responses to this entry through the RSS 2.0 feed. Responses are currently closed, but you can trackback from your own site.